The Sea & Sand Isidore Spring Special Edition | The Attic Shoppe Trading Co.
Spring has most surely faded into the background for the oppressive heat of July and I can’t say any of us are very happy about it. There is also the fact that spring was barely a hiccup of time around these parts. 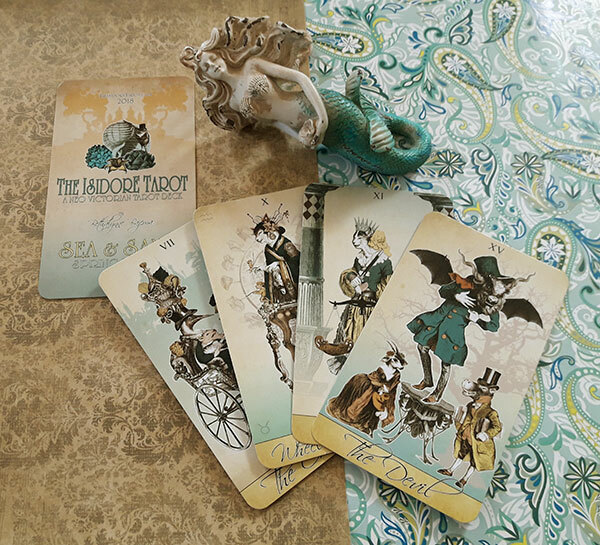 So while this special edition sale concluded, between constant requests and a basic desire to remember spring for a few more minutes as those hundred degree temps continue to loom, The Attic Shoppe is bringing back the Sea & Sand special edition of the Isidore Tarot. Below are options for the deck with full packaging, just the deck and book, and how international customers can order the deck. Within the coming weeks we’ll also be offering the doll size version of the deck in this edition as well. I’m still reworking the artwork (which means shifting the artwork for each individual card to fit the size, not just resizing, so it takes a lil bit to get it finished) but I’m just about done. This sale will continue to the end of summer with shipping beginning mid-August. And then this bright and springy deck officially gets tucked away till next spring. DETAILS ABOUT THIS EDITION: The Sea and Sand Spring Edition of the Isidore Tarot features a switch in the color palate. The rose and gold of the third edition's major arcana has been replaced with sea and sand shades. The minor arcana have been given a little color tweaking to bring out the colors and give a bit of a sun glow to the them. This version is based on the new third edition of the deck. The third edition of the Isidore Tarot says goodbye to the white borders of previous editions and offers cards with full bleed artwork. DECK DETAILS: The cards are 2.75″ x 4.75″ in size. They’re printed on 300gsm card-stock that is sturdy and has a smooth finish. Cards have a blue core that helps prevent transparency of the card so both sides feature brilliant colors. They’re very easy to shuffle and good for everyday use. The full packaging option of this deck includes the deck, packaged in a drawstring bag and stored in a labeled metal tin with additional decorating. It includes the companion book and mini-prints of deck artwork. To see samples of the entire deck art, please visit our Sea and Sand page here. 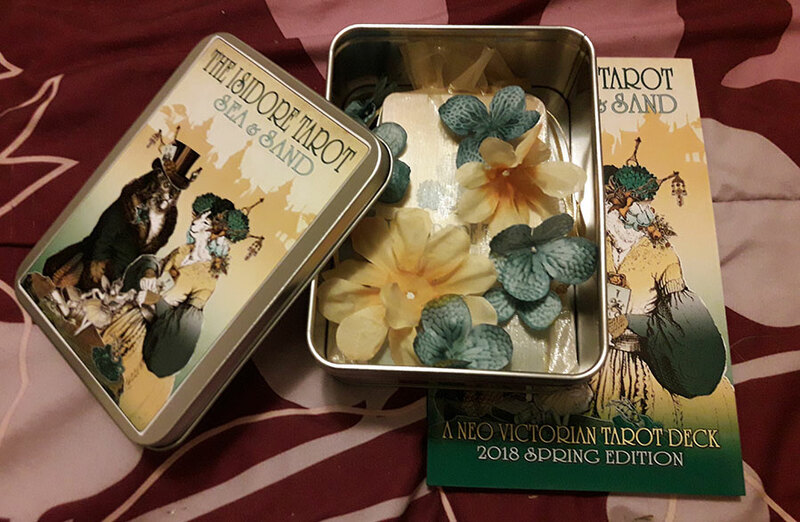 This version features the deck wrapped in a sheer organza bag within a tarot tin, with companion book, and a variety of small extras, and of course our shoppe thank you stuffs. This listing is for US orders only. Please remember that orders from this sale will not be ready to ship until mid August. Thank you. This version of the deck is simple and sweet and meant for tighter budgets. It includes the deck with card box and the companion book. Like with all of our orders we do include a few extras as a thank you. For international orders please contact us with your city/state/country of origin so we can calculate accurate shipping for your destination. All international orders are invoiced through our Paypal account. Shipping rates will vary greatly depending on your location. Custom and other international mailing fees are seperate and subject to your country’s laws/regulations.